Kenly Baker is alone. TOXIC has been defeated. Her friends from the McDonough School for the Talented are scattered to the wind. Even Kenly’s only living family member cannot hide the scared teenager from those who wish to contain her. Because Kenly is one of the Created. For her, it’s a future worse than death. She travels across the Atlantic Ocean, to the slums of London. There, Kenly finds tentative acceptance among a group of outcasts. They have spent their enire lives dodging shadows, barely staying alive. Kenly thought she knew what horrors haunt the night, but her new companions reveal predators far more alarming than anything she’s ever faced. Suddenly, she is brutally aware of the dark side of humanity. Kenly’s biggest concern was the UNITED trackers, who round up and capture the Created. But there are adversaries in this new world who are far more terrifying. And unfortunately for Kenly, now their sites are set on the Created. First let me say that this book is a companion novel, not a stand alone. 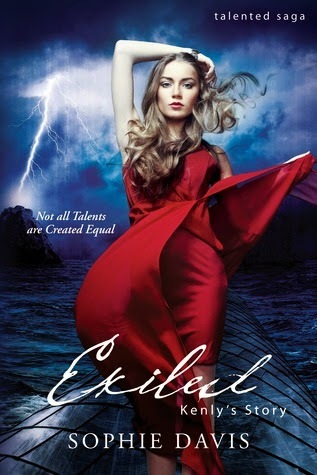 For your best reading experience I suggest reading the entire Talented series before picking up Exiled. There is a lot of background that you will need in order to truly understand what is going on. Exiled follows Kenly Baker, the one time protege of Talia, as she finds herself alone and on the run from the newly formed Union organization. The Created are being hunted and in order to survive Kenly escapes to London hoping to find safety. I love that we are getting to see more of the world and characters that Sophie Davis creates. I think that one of my favorite aspects of her books in this series is Sohie's character interactions and the bonds they create with one another. Sophie writes these characters raw, there is no fluff and filler to who they are. We seem them at their best and their worst and Exiled is no different in this aspect. I loved all the 'gang' in this book Willa, Honora, Riley, Tug, and of course James. Ah, James, the brooding hot boy with an edge that girls just can't help but swoon over. I really liked his protectiveness and compassion. His relationship with Kenly is wonderfully sweet and well written. He's just one of those characters you immediately take a liking to and only adore more as the book continues. He and Erik are definitely two amazing make heroes. The start of the books is a slow build up, I find this to be common in most of the series. There are a lot of pondering and thoughtful moments looking back on the past for Kenly in the first several chapters, but don't let that discourage you. As usual with this series once the action begins it is full on and loaded with twists and turns. So just keep reading! This is a great series for Young Adult book fans. If you enjoy Dystopians, Science Fiction, and/or Contemporary Romance this is a great read for you. If you have already read the other books in the Talented Series do not let this one slip by it's a must read as it brings back some of your favorite characters, introduces you to new ones, and sets us up for what comes next! ophie moved to Washington, D.C. after graduating from Penn State University to pursue a career in the Sciences. After deciding to actually write down one of the stories she makes up in her head, Sophie began the long journey towards her first full-length novel, Talented. Caged is her second novel, and the second in the Talented Saga. Hunted, the third novel in the Talented Saga is available now. The final installment in Talia's story, Created, will be released in Summer 2013! PAWN will be the first book in Sophie's new series, the Nightmares Trilogy, and is set for April 26, 2013 release. When Sophie isn't hunched over her computer, she can be found shopping in Georgetown, running in Rock Creek Park, or at the local dive bars in her Columbia Heights Neighborhood. Stay With Me - Release Day Launch!